A bus carrying travelers from Colombia and Venezuela crashed in Ecuador early Tuesday, killing 24 people and injuring 22 others, officials said. The dead included an unspecified number of Venezuelans and Colombians, whose embassies were notified of the accident outside Quito, they said. "Most of the victims were Colombians," said Juan Zapata, security secretary for the capital city. The bus, which had foreign license plates, was on a downward stretch of highway 30 kilometers (20 miles) east of Quito when it struck an all-terrain vehicle and overturned, slamming into three houses on the side of the road, officials said. Three Ecuadorans in the all-terrain vehicle were among the dead, said Christian Rivera, the head of Quito's emergency operations committee. Also killed were three children, he said. "The work is focused on identifying the Colombian and Venezuela citizens, most of whom have died," he said. "Our emergency teams went to the site to support the rescue work. We extend our solidarity to the families," Rivera said on Twitter. 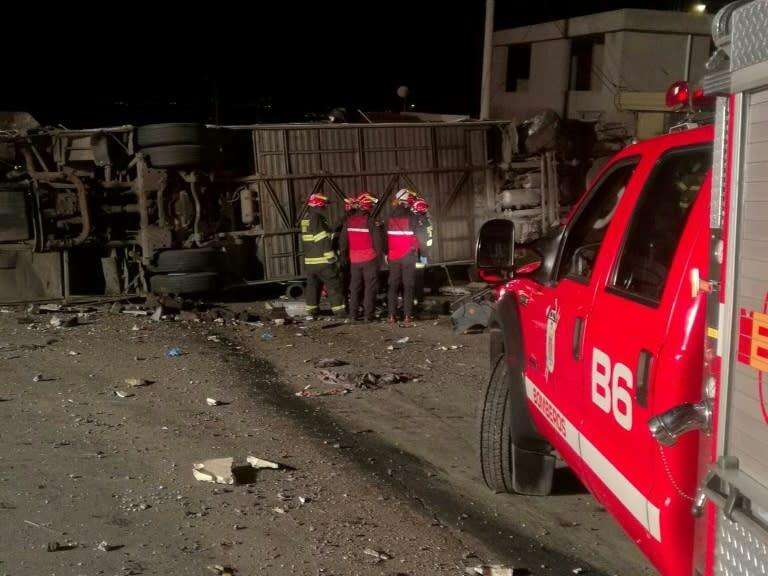 A Quito fire department official, Veronica Toapanta, said that the crash took place at dawn between the towns of Pifo and Papallacta. Traffic accidents are among the leading causes of death in Ecuador. According to the watchdog group Justicia Vial, on average seven people are killed and some 80 people injured each day in traffic accidents. And 96 percent of those accidents are due to human error, according to the group's figures. On Sunday, 12 people were killed and 30 injured when a bus carrying fans of Barcelona SC, Ecuador's most popular football club based in Guayaquil, ran off the highway and flipped.